Grandmama’s Failproof 7 Minute Frosting is light and fluffy and the perfect topping to most any cake! If you’ve never had this icing, I’d like to apologize. I am so sorry that you’ve missed out all these years. This is a fluffy, light tasting icing reminiscent of marshmallow cream, only better. It’s commonly found atop coconut cakes or other holiday cake treasures but goes just as easily with a plain yellow or chocolate cake, too. Unlike most 7 minute frosting recipes, this one is not dependent on the weather or you crossing your pinky toes and perfectly reciting the magic word with five extra large marshmallows in your mouth. No siree, this one comes out perfect every time. Just like Grandmama’s always did. It’s no wonder, too, because we found this written in her own hand in her cookbook after she passed away. Here Mama had been fussing with making 7 minute frosting during the ideal weather conditions and Grandmama’s turned out perfect every time. 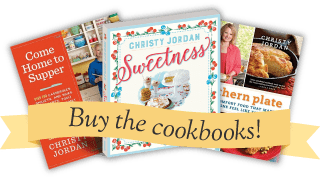 It never occured to Mama that Grandmama might be using a different recipe – and it never occurred to Grandmama that Mama might not have her recipe, either! 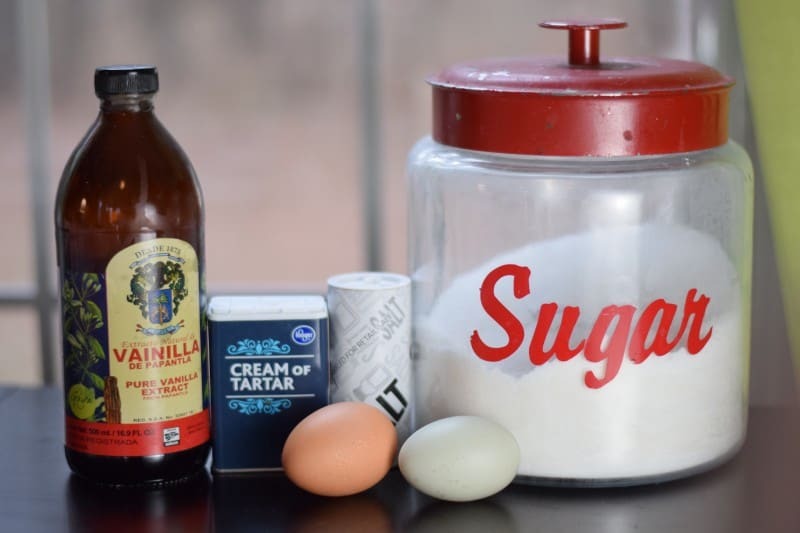 To make this, you’ll need: Sugar, 2 Eggs (for the whites only), Cream of Tartar, Salt, and Vanilla. Place all ingredients into a thick bottomed sauce pot. Hint: When separating your eggs for this, it is a good idea to do so in a separate bowl rather than the pot you are going to combine all ingredients in. The reason for this is that you need only the egg whites and if you get any of the yolk mixed in, your icing won’t turn out. 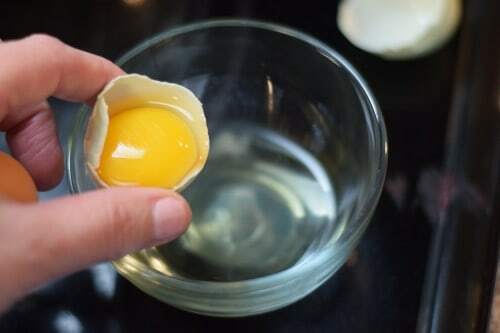 By separating them beforehand, you can throw out anything that gets a yolk in it (or dig out the yolk if you can without combining it with the white) rather than having to throw out your entire pot of ingredients. If you happen to sling some of it around while whisking away because you got distracted having a conversation with your dog, wipe it away immediately because this mess is like tar once it dries. Don’t worry, it stays all nice and fluffified on a cake :). Now listen, right about now you’re going to be thinking “Christy is crazy. This is never going to form stiff peaks. I’m sure this is as good as it will get. I might as well give up and just ice the cake.” Trust me and keep beating it. It will be a totally different creature in a few minutes. Note about following this recipe: The pattern on “the internets” these days seems to be taking a recipe, making fifty thousand substitutions and alterations to it, and then getting your tinsel in a tizzy when it doesn’t turn out exactly like the original recipe said it would. I’m not saying you would ever do that, mind you, but I do want to issue a word of caution that this is one of those recipes which really must be followed to the letter. If you go rogue, you get rogue results. Maybe those will be good, maybe those will be bad, but they won’t be on me either way. Look! We have stiffness! You can see how the icing is maintaining the trail left by the beaters rather than sliding back into a glop. This is what we want. Now add in your vanilla…. Note: Really try not to forget the vanilla. Having said that, I almost always forget the vanilla. But that isn’t the worst mistake you could make. Last time I made this I accidentally doubled the salt (talking to the dog again). You know what I did? Played it off like it was supposed to be that way. You better believe it! Salted everything is all the rage these days anyway, plus it was just 1/4 teaspoon – and its not like my family has ever once looked at this recipe so for all they knew it was supposed to be that way. And here are our “stiff peaks” with vanilla all beat in. You see how you can see a perfect trail of where my beaters were rather than any of the icing sliding back down to smooth? This is what you want. Remove this from the heat and have a little taste of it – pure Heaven. Now whenever Mama and I make this, there are tiny sugar granules mixed amid the fluffy velvet cream – and it’s just perfection, like my Grandmama’s icing, so don’t think you did anything wrong. Just dip your spoon in again and pop it in your mouth, close your eyes, and enjoy the smoothness of this marshmallow cream-like icing as it melts in your mouth. Ice your cake and you’re good to go. This icing is very stable and keeps well for up to a week on an ice cake stored in the refrigerator. Enjoy! You don’t need a double broiler to make this and you can forget fretting over whether or not the weather is dry enough for a 7 minute frosting to “turn out”. This one comes out perfect every time just by following the instructions. Combine all ingredients except vanilla in a stainless steel heavy bottomed sauce pan. 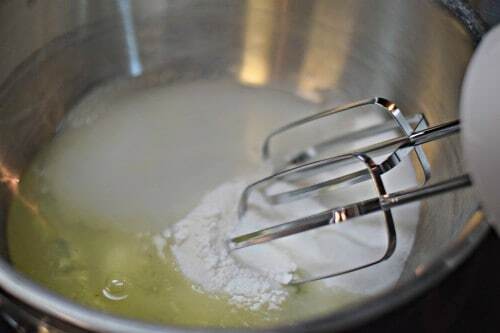 Place over medium low heat and beat with an electric hand mixer constantly for 5-7 minutes, or until icing is fluffy and stiff peaks form when beaters are removed. Remove from heat and stir in vanilla. Ice cake. It takes two recipes of this to ice a layer cake. Note: You'll need two recipes of this icing to ice a layer cake. This recipe doubles beautifully, no need to make two separate batches, just double it and make it all at once. Christy: I have never had “7-Minute Icing”. I tried making it one time, and it didn’t work. Afterwards, my mother told me that we were genetically incapable of making it. She had never been able to make it and quit trying. She was the best cook I’ve ever known, so for once, I gave up. I may give your recipe a shot. Thanks for the tar note. I will try to wipe as I go because neatness, especially when stirring, mixing, and beating is not even close to being one of my strong points. This is the best!! Oh my goodness! I will never use my other recipe again!! Great to see you here! All of my recipe posts have the full recipe in printable format at the bottom of the post. If you’ll just scroll up a bit from where you typed this you’ll find it there. If you are going to eat it within a day or two you don’t have to refrigerator it but I would if you want it to last any longer than that. Will this frosting hold up for a few days? I have read other recipes tend to fail and the frosting dissolves. I need one that holds up for a party. The earliest I have ever made it is a day or two beforehand. If you make it the day before it should be fine 🙂 Store in fridge. Hi, im very keen on trying this recipe is it ok to hold up a 3 tier cake each tier having 4 layers. Ahhhh, the memories of my mom, aunts, and grandmas waiting on the perfect weather for making icings and candies. lol My mom bakes a ten layer cake that needs the perfect weather for the icing to turn out good. I have recipes handed down with notes about making it only when the weather is nice. lol Thanks for this recipe, I look forward to trying it out. Also, thanks for the tips of following it exactly. Merry Christmas!!! Oh, this stuff is just wonderful. And in my family, it is not a coconut cake unless it has been iced with this and then completely covered in coconut. And you’re right about not messing with this icing. Christy, is this a recipe you can double, or do you recommend making two separate batches to frost a two-layer cake? Sometimes doubling works, sometimes it doesn’t, and I really don’t want to mess this up. I usually double it, works every time with no problem. Thanks for asking this! I’ll go add it to the recipe card so other folks know. I appreciate your help! I am making this for a 3 layer cake, can it be tripled and cooked in a large pot? Thank you! I have the same question as Ann. What a great story and memory! I loved your story! And I remember the recipes in the Boston Globe and still have several clipped-out copies from ages ago. This recipe sounds great! I’m going to try it on a coconut cake for Christmas. I’ve made 7 Minute Frosting before but this sounds easier. I started following the blog recently and have been enjoying it very much. I know, I know..I do that sort of typo ALL THE TIME! My standard birthday cake growing up was a made from mix angel food cake (confetti if I was extra lucky!) with 7-minute frosting and one of those hard candy cake decorations you bought at the store, soaked a bit in water to release from the paper and then put on the cake. 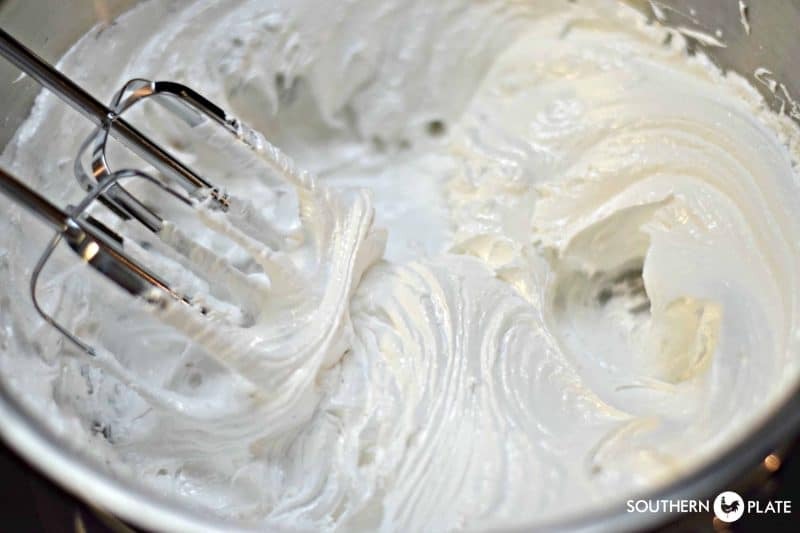 My brother and I have tried to track down my mother’s 7-minute frosting recipe, but I’ve never been sure which one it was (even though I made it once or twice when I was still living at home). I’m happy to have a tried and true recipe to try! Thanks! I do remember rigging up two pans as a double boiler when I made it, but that’s apparently not necessary for this recipe? Do the ‘tiny sugar granules” dissolve? I can make sugary frostings all day long but this recipe of your Granny’s sounds perfect as long as it has no grainy texture. I’m pretty sure the sugar granules are from cooking this over direct heat. I have always made mine in a double boiler (or diy metal bowl or pan on top of a pan). My mother told me about 40 years ago when I made it for the first time not to let the boiling water touch the bottom of the upper pot because it would make it grainy, instead of silky smooth. It’s still very much silky smooth, with a sweet granule from time to time. The heat is so low and it’s cooked the same time as in the double broiler that I don’t think that would make a difference, but you can certainly use a double broiler if you like. I think today’s stoves being able to regulate heat so well have made them unnecessary for the most part as opposed to when stoves were more difficult to have an actual low temp. 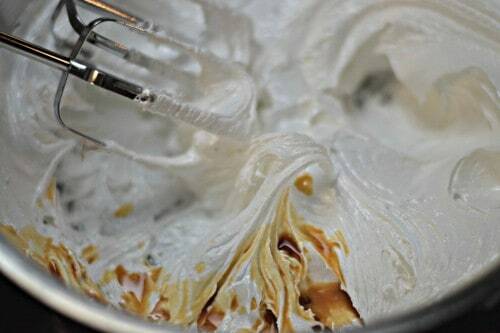 We use to make this icing when I was at home. I had forgotten about it. Its a wonderful addition to any cake. Thanks for sharing. Love your style. We call this “White Mountain” Frosting. It is the BEST in the world and so simple. Just made it a couple of weeks ago for….what else…..a Cocoanut Cake my husband was craving. 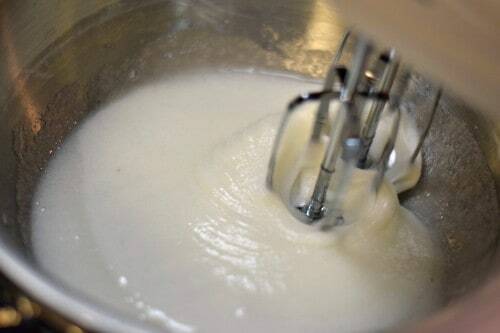 Christy, I’m almost 80 years old and I grew up in TN near Memphis with my mother making this beautifully smooth and creamy 7 Minute Frosting for cakes. This was in the day when home cooks didn’t have an electric mixer. This frosting was made using a rotary hand mixer, which I thought was fun when I got big enough to help crank the handle of that rotary mixer making this scrumptious frosting. This was the perfect and go-to frosting used for most of her cakes, and was always a hit. It was used to make my mother’s famous Coconut Cake at Christmas, using freshly grated coconut. She never used packaged store-bought coconut, it had to be made using a freshly grated coconut, which my Daddy would crack open and get the coconut “meat” out of the hard shell. 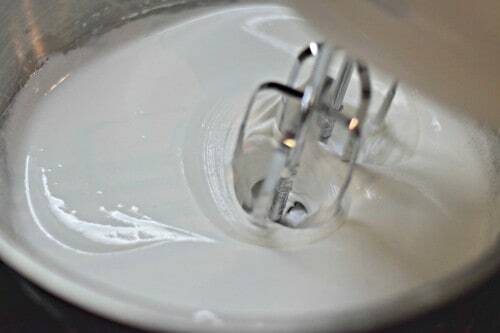 7 Minute Frosting was the first frosting recipe I ever learned to make, and I continue today making this quick and easy frosting. For decades I’ve maintained making the traditional fresh Coconut Cake each Christmas. My family would revolt if I didn’t make it with 7 Minute Frosting piled high under the coconut! I’m so glad you mentioned this, because that’s the only kind of mixer I own. Now I won’t be afraid of trying this recipe! Oh my goodness, what wonderful memories!!! Hi Ms Christy! Do you have that Coconut Cake Recipe? Coconut cake with seven minute frosting was a part of my Christmas many years ago. My Dad also fixed a fresh coconut for my Mom. Remember my Sis and I sharing the milk from the coconut. Daddy always grated the coconut and called it a fingernail cake! After I married just knew I had to make a fresh coconut cake for our Christmas. I did and it was my first and last fresh coconut cake. Just too much work fixing the coconut when frozen coconut was around. Always enjoy your blogs and the many good memories it brings. Thanks, and have a great Christmas! My granny used to make her coconut cake that way too! She made the cake from scratch fresh coconut and pineapple and bananas! I’ve never tasted a cake that good in my life!! I’ve got her recipe and have attempted a few times but it was never as good as hers!! It wasn’t an easy cake to make either!! I miss her so much and that cake! Thanks for this recipe. Hopefully it will turn out better than my others have. Mine is either grainy or it weaps real bad! We will see! I would love to have the recipe! I would love that cake recipe also! Great recipe! At Christmas time, my mom made this same recipe but put some peppermint extract in it instead of the vanilla. Made chocolate cupcakes and dollaped a cloud of this 7-minute-minty-goodness on top and placed a mini candy cane in it for our classroom Christmas party. If I don’t have time for cupcakes (or not enough mini candy canes), then I bake a chocolate sheet cake, swirl this delightful stuff over the top and sprinkle broken candy cane bits on top. What a great memory and idea!! I can’t wait to finally try this icing for myself. No more intimidation! I am going to do it. Thanks Christy. You can do it Joyce!! I have faith in you!! I have two question about the 7 minute frosting. First is your stove electric or gas? I have a gas stove and was wondering if the heat would be lower than an electric stove for this recipe. Will it stick to the pot if it is too hot? Second do you leave the heat on the entire 7 minutes? Thank you for all your beautiful memories and recipes. I love reading about you and your joy of cooking. Hope you and your family have a very Merry Christmas and much happiness in the new year. I will have to try this version next time for my coconut cake. I love the idea of NOT using a double boiler. They just make me nervous, especially using an electric mixer and it just doesn’t feel stable sometimes. I will make it as you say and not go all “rogue” on you honey! 🙂 Doubling is definitely the way to go, because who can resist dipping their finger into that light and fluffy goodness! I’ve been looking for this frosting for some time now, and guess who came through? Christy, girl you did it again. I remember as a little girl, going over to our next door neighbor’s house Mrs. Mary Lee; and she would be making this fabulous Coconut Cake. My, my, my, I wanted to take a bite out of that cake so bad, but I knew Mama, Big Mama and Mrs. Mary Lee would tan my britches! As they would say back in the day. So Thank You So Much Christy! Hope You and Your Family Have a Very Merry Christmas. Be Blessed! 🙂 I hope you have a very Merry Christmas too Annette!!! God Bless! Seven minute frosting was the very first frosting I ever made. I made a chocolate cake iced with it and chopped pecans sprinkled across the top. I swear the whole cake was eaten up in less than 5 minutes. It was so good I never got to have a piece. Are the egg whites beaten before being put on the stove? Love this, but I usually make the cooked white frosting where the syrup is cooked to the soft ball stage . It’s just a cup and a half of sugar, half cup of water, a fourth tsp cream of tartar, dash of salt. 3to 4 egg whites already beaten to peaks and the syrup poured slowly over while beating. Honestly it takes just a few minutes to beat it to the perfect consistency. Do not forget the vanilla! Do you not like this kind? On a yellow cake then covered with thawed frozen coconut has made me famous with friends and family! Love you and all you do! Merry Christmas!! We are essentially talking about the same icing, just different ways of making it. I love it! Love you right back and I know you’re fame is well deserved! Hi Christy! This frosting looks delicious – can’t wait to try it 🙂 I have a question for you, not about icing. When your children were younger (elementary school age), what did you send to school for their lunches and snacks? We love your recipes, so I thought you’d have some kid friendly ideas 🙂 Thanks so much! Merry Christmas! My mother made this icing all the time. It was so delicious. Had to compete with two brothers to lick the spoon. Just as others have commented- this was the first homemade frosting I was taught to make. My aunt taught me to bake while my mom was taking care of the other 5 children in the family. We made all kinds of cake. Sometimes I still crave a spice cake with this frosting! Thanks, Christy! Awww, you have made my day Brigette!! Love you too and I hope you enjoy the frosting!! When I was a kid, I did not like frosting–EXCEPT 7-minute frosting. My birthday cake every year was a confetti angel food cake (with the colorful sprinkles mixed in) with 7-minute frosting. If I was given a slice of regular layer cake, I’d eat the cake out of the middle and leave the frosting. (Unless it was chocolate, then I might eat the middle layers, but leave the outside.) Needless to say, I share your love of this luxurious, fluffy, marshmallowy confection. And now I have no choice but to try Grandmama’s recipe and see how it compares. Can you make chocolate icing by adding cocoa?? How much would you add to your recipe? I’m sure you could but I’ve never tried it so you’ll have to experiment. Please report back, sounds delicious! I’m not sure what I’m doing wrong… when I’ve made recipes (similar to this) in the past, the frosting “shrinks” on the cake in a couple of hours. I’ll pile it up on the cake and by the next day it’s half as much? It tastes amazing, but it’s always been pretty much make it and serve immediately. Does your do that? What can I do to make it more stable? I can’t wait to try your recipe this weekend! Making a coconut cake for my favorite sister in law! Seems like possibly not enough sugar, not beaten long enough or too cool temperature.